I wasn’t planning to visit Intersolar 2007 on Saturday, June 23, 2007, the last day of the tradeshow. Although I thought there would be throngs of consumers looking for home solar solutions, there was lighter foot traffic than the first two days. And, since the business meetings were almost complete, there was improved access to upper management at the individual companies. 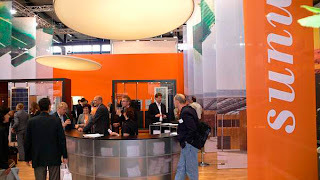 As I stood at the Sunways AG (FRA:SWW) stand main desk waiting to ask questions about Sunways will be supplied with two reactors for the production of high-purity silicon (Deutsch), I noticed a gentleman from Sunways taking photos of the stand. I thought I recognized him from the 7. Forum Solarpraxis as Sunways CEO Roland Burkhardt. As it turns out, Herr Burkhardt took a photo of me (right front) at the main desk before I noticed him at the stand! We want to develop a secured long-term procurement strategy of high-purity silicon with better terms than long period contracts with prepayment. Wir wollen uns eine Absicherung von Reinstsilizium aufbauen, die uns besere Bedingungen bietet als Langfristverträge mit Prepayment. The two Siemens process reactors will be ramped to 300 metric tons of electronic grade polysilicon production capacity per year by 2009. Sunways has partnered with SolMic GmbH and other suppliers to obtain all the required production equipment. Sunways is in discussions with three potential locations (partners) for essential trichlorosilane (TCS) supply and co-location of polysilicon production. Selection criteria beyond TCS include skilled employees, energy costs, and economic incentives. The 300 metric tons of polysilicon capacity translates to about 30MWp (MegaWatts-peak) of monocrystalline or polycrystalline silicon solar cell production depending on silicon utilization in grams per Watt. Sunways produced 28MWp of solar cells in 2006. 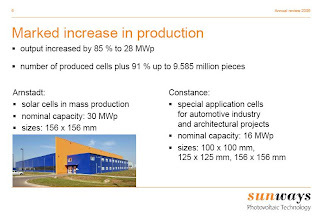 Sunways’ nominal solar cell production capacity is 30MWp in Arnstadt, Germany, for traditional modules and 16MWp in Constance, Germany, for automotive and architectural applications. Given existing sources of wafer supply and recent deals (see Sunways AG enters into a contract on the supply of wafers with Deutsche Solar AG), Sunways decided to sign a long term polysilicon supply deal with an unnamed cooperation partner and received an up front payment of €10 million for future polysilicon shipments. Alas, fair disclosure regulations and competitive considerations don’t allow even CEO’s to disclose new information on a selective basis. But in a report titled Own silicon production, equinet AG has compiled additional details and analysis perhaps with inputs from a conference call. Polysilicon production volumes are expected to reach about 200 metric tons in 2008 at a production cost below €45 per kilogram. equinet estimates capex (capital expenditures) totaling €20 million for the project, and Sunways has stated most of this investment will occur in 2007. equinet has helped underwrite securities for Sunways in the past. I was able to confirm a report in Photon International (PI 6/2007, p. 50-51) with a Sunways spokesperson. Sunways does have an option to buy five additional reactors with the potential of expanding production capacity to about 1000 metric tons of polysilicon per year. In Part 2, I will continue examining this polysilicon project and delve into Sunways’ automotive efforts. Things have been quiet on the Blog this past week. Although my pipeline is overflowing, I had to drop everything because of family visiting the Bay for the last two weeks.